Are you having difficulties with your "black-box" extrusion controllers? Melfi Extrude© is the next generation of PLC-based automated extrusion controllers. 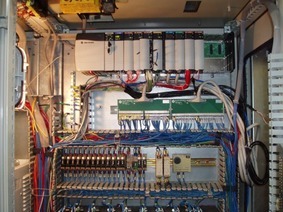 The system is designed to integrate all discrete components onto the PLC chassis for more reliable operation, and moving all the control operation onto the touchscreen allows the installation of redundant monitors to operate the extrusion line from multiple locations (at the extruder, at the feeder mezzanine, from the operator control room and/or remotely via Modem or VPN connection). The Melfi Extrude© PLC controller has been developed around the Allen-Bradley ControlLogix and CompactLogix hardware platforms, using standard RSLogix5000 programming software with Rockwell Automation FTview HMI. We have created a cost effective solution using non-proprietary hardware to simplify the extrusion control process. 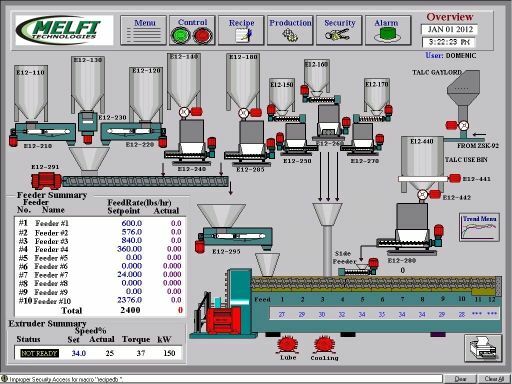 The Melfi Feed© gravimetric feeder control system is seamlessly integrated into the Melfi Extrude© PLC with no proprietary microprocessor controls to communicate with or maintain. We can directly replace the proprietary feeder control equipment supplied by any of the popular LIW feeder manufacturers. The Melfi Batch© recipe control system can be seamlessly integrated into the Melfi Extrude© PLC to automatically formulate, on demand, all Master batch ingredients to reduce operator error and prevent missing materials from the final product. Melfi Technologies has completed a combination extruder and gravimetric feeder control retrofit at a major automotive structural plastics producer. The existing ICMA extruder included a Siemens PLC that was software locked to prevent user programming changes. The customer could not add safety interlocks between the various pieces of equipment, so the operators had to run between the different control panels to start-up and shutdown the compounding line. The discrete temperature zone controllers were becoming old and difficult to maintain, and would experience temperature drifts up to 50F. The feeder proprietary controller was obsolete, and the feeder manufacturer was pushing the customer to retrofit to their newest proprietary controller. The extrusion controller has been developed around the Rockwell Automation ControlLogix and CompactLogix hardware platforms, using standard RSLogix5000 programming software with RSView32 HMI. The field communications to the downstream pelletizer, motor drives and load cell amplifiers are open standard Ethernet/IP components. After reviewing both their control system capabilities and previous extrusion installations, Melfi Technologies was awarded the project to convert the complete compounding line. The entire Siemens PLC and proprietary microprocessor-based control system was removed and replaced with an Allen-Bradley ControlLogix PLC performing the LIW algorithms. All existing enclosures were retained to minimize field wiring. Flex I/O modules were installed in the feeder enclosure, and a single Ethernet cable connected the two modules. 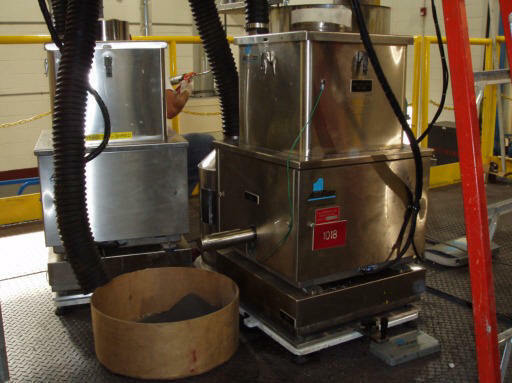 Hardy Instruments WAVERSAVER® weighing modules were mounted onto the existing feeder enclosure to directly read the load cell weight. The Hardy C2® certified load cells communicated the calibration parameters to the Ethernet/IP weighing modules, so the feeders could be calibrated without using calibration weights. 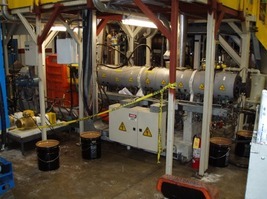 The compounding line was retrofitted, commissioned and operational within a two-week time span. The extrusion system continues to perform well, with greatly improved quality of the finished product and increased up-time making good product. Since the initial commissioning there have been no additional service or repair return visits by a Melfi Technologies field programmer.